PHILADELPHIA – When I first heard that the Pope was coming to Philadelphia and the number of people that were expected to visit the city I immediately began thinking of places I could go to get out of the city. It had nothing to do with the Pope at all, but rather the large crowds. It wasn’t until I attended a meeting with the Communications department at the American Red Cross in Philadelphia that I decided to stay and be a part of it. During the meeting Anthony, Loa and Lauren talked about needing volunteers during the Pope’s visit and how it would be a great once-in-a-lifetime opportunity. After the meeting and doing some serious thinking I wanted to be a part of it. I really do believe that this will be a great experience. I committed myself to stay the entire time they needed volunteers from Thursday afternoon until Monday morning. After I made this commitment I also decided to stay at one of the many staff shelters that the Red Cross has set up throughout the city. After hearing about the many road closures and detours on SEPTA this was the best thing for me to do. When I arrived on Thursday I had no idea what to expect as far as the staff shelter. This is the first time I would be staying in one. Even though I had no idea what to expect I was still every excited. The shelter I am staying at is across the street from headquarters at an elementary school. When I first arrived they were still in the process of setting up cots and there were quite a few people in there. Each cot had a Red Cross blanket and pillow on it. Some were taking a nap and others where claiming their spots like I was. There are volunteers from the area and out of state staying in the shelter. After blowing up my air mattress I headed back over to headquarters for a meeting in the Communications department. During our meeting I got to meet everyone that would be making up the communications team and finding out what our game plan was for the next couple of days. Most of our volunteers didn’t have to travel too far except for one who came all the way from Oregon. Once done at headquarters and eating dinner that the Red Cross provided I headed back over to the shelter. The scene was much different than before. Many more people had arrived and you could feel the excitement as well as tiredness in the room. Before you knew it lights were out and all you could see were lights from computers and cell phones. It was a time for quietness and relaxation, something that doesn’t always come easy for me at home because there is always something to do. Overall my first night went very well and better than expected. The night was rather quiet except for the sound of more cots being put up. As others came in they were very quiet and respectful towards those that were sleep. On day two of my volunteering with the Red Cross I had the opportunity to explore the city with Lauren and two other volunteers. During our exploration we visited a First Aid station near Ben Franklin High School and the staff shelters set up in three buildings on Community College of Philadelphia Campus. Before reaching our destination we had quite an adventure. Navigating the streets of Philadelphia became very difficult, especially if you don’t know the city. Good thing for us our driver, who has been transporting people all day long, knew exactly what streets could be used and which ones to avoid. There was also a great presence of Philadelphia Police and the National Guard. It wasn’t until we got further in Center City that we saw the large crowds of people taking in the sights of downtown Philadelphia. There was a very long line of people waiting to get an up close and personal look at the Liberty Bell. Before the Pope arrives visitor are using their time to enjoy the city and visit the historic sites. Our first stop was the Medical Station near Ben Franklin High School. This is one of nine that are set up throughout the city. During our visit there wasn’t much going on at the time. We were able to go inside the medical tent and talk with some volunteers that will be working the station. Inside the big blue tent they had several stations set up with cots, blankets, and medical equipment. Outside relaxing in the shade was Kathy, a Spiritual Care Responder volunteering with the American Red Cross through Lutheran Disaster Response. This weekend she will be a behavioral health responder and her duties include providing information, communicate between individuals in the medical station and their families, help orient those in distress, talk with those who are overwhelmed to find out what is bothering them and get them back on their way. If further care is needed beyond the tent the responders are to alert the proper people and keep accurate documents of who visits the tent. 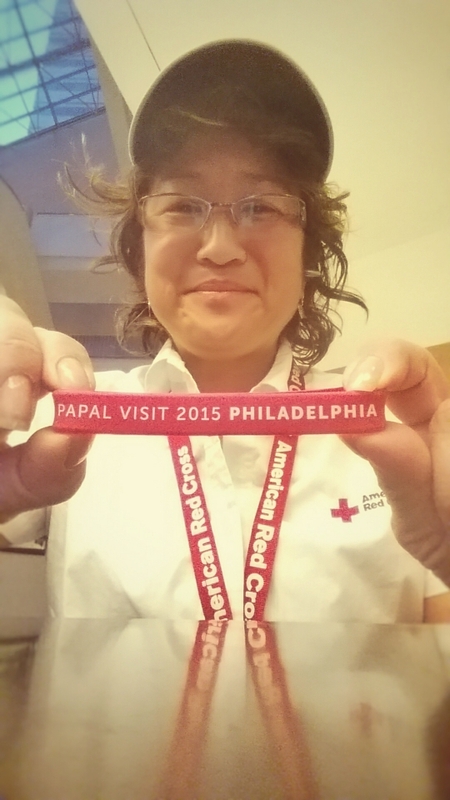 When asked why she chose to volunteer for the Papal visit her response was this is a once-in-a-lifetime opportunity. She said if she can see him up close that would be nice, but just being here volunteering, seeing him on the big screen TV and hearing the mass is good enough for her. She also mentioned how the community and different organizations are coming together as one and looking out for each. Like Kathy, who didn’t have to travel too far, this historical event has brought people from all over to Philadelphia to volunteer. It has also brought people from all over the world to be part of the World Meeting of Families and to celebrate the Pope in the U.S. I just had to share an experience I had last week, while assisting with the flood recovery efforts in South Carolina. I have served for seven years in this organization and today for the first time I was speechless. I was sitting and talking with a family at the shelter, who had lost everything this past weekend because of flooding. They have a 6 year old daughter and 3 boys. After playing games with the kids for a while, the daughter disappeared for a few minutes. When she came back this is what she gave me…along with a giant hug and said thank you Red Cross. 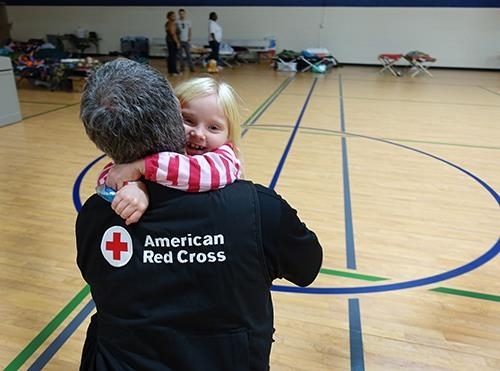 This was a real reminder of why we do what we do and why I encourage everyone to support the mission and work of the American Red Cross. When I learned that Pope Francis would be visiting the United States, specifically my home city of Philadelphia, I booked my airline ticket from Portland, Ore. to Philadelphia, Penna. It must have been divine timing, as I return annually about this time of year to visit family and friends. For the past year and a half, I have enjoyed volunteering for a variety of charitable organizations’ special events. Knowing that the American Red Cross supports humanitarian needs, I contacted my colleague at the Red Cross in Philadelphia to see what needs the communications team might have. 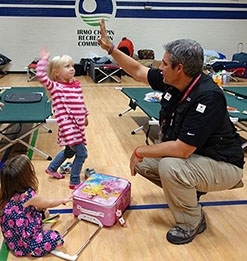 With 20 years of staff and volunteer experience with Red Cross Disaster Relief, this was going to be a once-in-a-lifetime assignment. What an exciting and challenging opportunity to serve my Red Cross in its efforts to make sure the people of Philadelphia would remain safe and well through the Pope’s visit to the City. 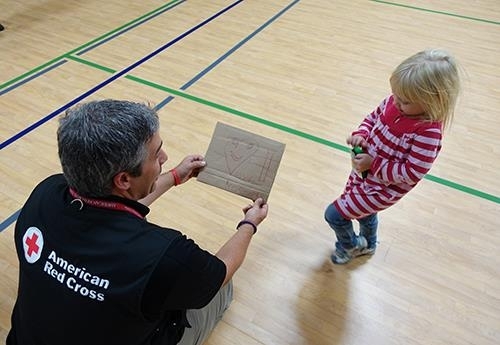 As one of nearly a thousand people, including Red Cross volunteers and staff, I and the team of about a dozen set out to capture, in words and images, the Red Cross at work. Along with our partner organizations, we set up first aid stations and reunification centers throughout the city. Our primary role at this event was to help reunite families and friends who were separated and could not get in touch with or find each other at the event. What an honor and a privilege to serve my home city in this historic — and personally humbling — event.